"A piece of paradise nestled between land and sea"
BOOK YOUR VISIT with us right now! "DISCOVER NATURE AT IT'S BEST"
You wish to escape to a place where you can reconnect with nature? Where you can leave all stress of daily life behind? Le Camping et Ranch du Fjord is your dream destination. Located in Baie-Sainte-Catherine, part of the The World Biosphere Reserve of Charlevoix, Quebec, just a few minutes before the ferry to Tadoussac, where the St-Lawrence river meets the Saguenay Fjord, host to the amazing spectacle of whales dancing freely and where the mountains, waterfalls and rivers are still free from human interference. Come and enjoy miles of hiking trails, or set off to sea on a zodiac boat for a unique encounter with the whales. Enjoy your evenings around the campfire and relax gazing at the stars on our beautiful camping ground complete with all the services, where you have a choice of wooded areas surrounded by bushes and mature trees or spots with a panoramic view of the St-Lawrence river and its fabulous sunsets. We invite you to take a look at our packages designed to match your specific interests and desires. Whether you are a nature enthusiast or simply looking for a comfortable campsite near Tadoussac, we guarantee to provide you with the perfect setting. Treat yourself to a fun filled holiday. 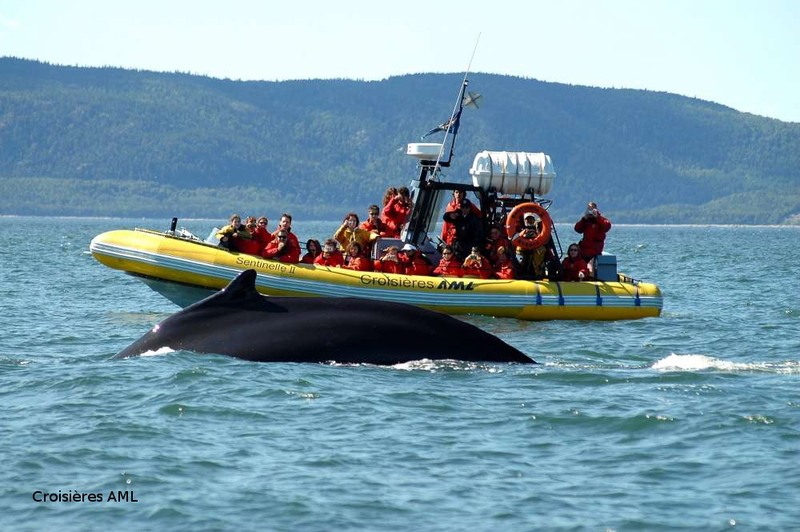 Enjoy a whale watching cruise, with or without a night on our campground. We're sorry to inform you that there will be no horseback riding this year. However, it will still be possible to observe the horses grazing in the pastures around the campgrounds. This summer, our trails will be accessible to hikers. From the campsite, the trail will take you to the fields, a river or a fall. What better than a walk in the forest where the calm of the place has the power to appease us. For those who love long trails with or without uneven terrain, we have added the trail map of the municipality of Baie-Ste-Catherine. We will be able to inform you of other trails located nearby, either on the Charlevoix or Côte-Nord side.